I’ve wanted to make a yogurt cake for absolute ages, and when I had the opportunity to make it I turned it into something else that could only be reminiscent of a soufflé. This is a recipe I’ve been promising for the better part of this month, so I’m happy to be finally sharing it with you. It all started when I said that I wanted to make a yogurt cake with some fresh blueberries we had. 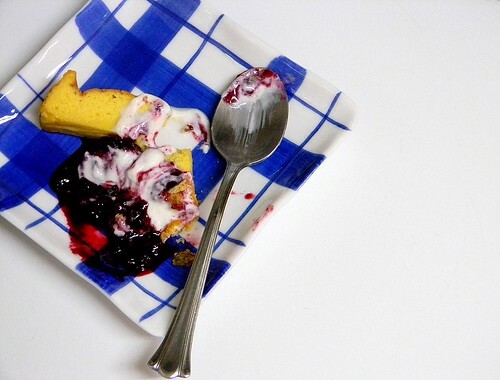 It quickly turned into an idea of a lemon yogurt blueberry cake. It was on a whim but as I ate a bowl of lemon yogurt, I got that baking itch and I acted on it. Going my way again of feeling out what felt right, at that crucial moment when I would add flour I thought that the batter already looked so lovely, what if I just baked it? As I took photos and followed along with my artist’s temperament that day, I virtually jotted down recipe notes in my shorthand: simplified instructions, details minimal since it’s for me. Most of my recipes are written like that, before I flesh it out. It’s quite a contrast to how I write recipes for this site. This was just one of those times I decide to write it down as I go along, so that I can recreate it again when I want to without trying to remember what I did. This soufflé, really a flourless cake, is a wonderful thing. Puffed up and beautifully domed, shortly after being pulled out of the oven it sinks into itself. A golden brown exterior makes a striking and elegant contrast to the sunny yellow inside. The lemon flavour itself is delicate; it’s light and satisfying, a lovely way to end a meal. As my brother is continuing to improve, he’s becoming more and more able to implement food into his diet that he couldn’t before such as small amounts of dairy. He sometimes has butter on his bread or rice cakes and on occasion he will now also eat goat yogurt and goat cheese, including feta, without adverse reaction. As you may guess, this means that my baking (and cooking) is not always exactly dairy-free anymore and that is reflected in the recipes I’ve been posting here, since listing butter as one of the ingredients along with a dairy-free alternative such as Earth Balance or coconut oil, if possible. The only dairy I’ve worked with has been butter and now also, thanks to this cake, yogurt. My Mum reminds us that food is very communal, and that it’s very important for people to feel a sense of belonging, whether or not they can tolerate certain foods in their diet. While there are many healthier choices of available foods today and greater awareness of these, it is important to have the ability to choose what one eats, and to have the opportunity to try different foods if one wants to, just to have had an experience of them, if nothing else. It’s not about getting hooked on sugar or any particular food addiction, but about having the choice, ability, and opportunity to experience all that life has to offer to each of us as human beings. Food is such a sensory-rich experience that is so basic to everyone, it is naturally sought out and explored for more than its necessary health and energy provisions; it crosses the boundaries of cultures and religions and customs and is experienced and embraced by all. I SO love food blogging! Leftover cake can be refrigerated and it’s possibly even better the next day – the refrigerated cake is firmer and has a more distinctive “crumb” appearance and mouthfeel. 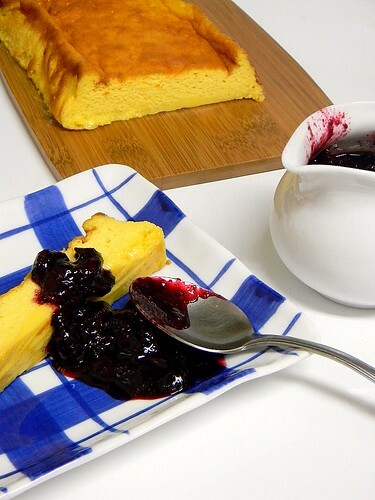 Cake on the first day is softer and has a slightly foamy texture. If you can’t find a goat lemon yogurt (I haven’t yet), simply flavour plain goat yogurt with some lemon extract or lemon juice. This also works with honey-flavoured goat yogurt, I imagine. If you can’t tolerate dairy, use a dairy-free yogurt of your choice such as soy or coconut milk yogurt instead and, again, flavour with lemon extract or juice if a lemon flavour isn’t available. Beat egg yolks with a whisk until thick and pale, a visible ribbon should be briefly seen on the surface when the whisk is lifted before the ribbon merges back into the yolks. Beat in butter or Earth Balance well until smooth and creamy without any lumps; it should resemble buttercream. Mix in honey and add yogurt. In a separate, clean bowl beat room temperature egg whites with water and lemon juice until soft peaks form. Gently fold the soft egg whites into the batter: spread the whites across the surface and cut down the middle of the batter with a rubber spatula, lifting from the bottom and folding batter over the whites on the right side. Repeat on the left and continue this motion, alternating between left and right, until the egg whites are completely folded in. Add lemon zest and extract, gently mixing into the batter. Pour batter into the prepared loaf pan and bake for 15 minutes. Rotate and bake for another 15 minutes. Remove from oven and cool. Like a souffle, it will sink or fall as it cools. 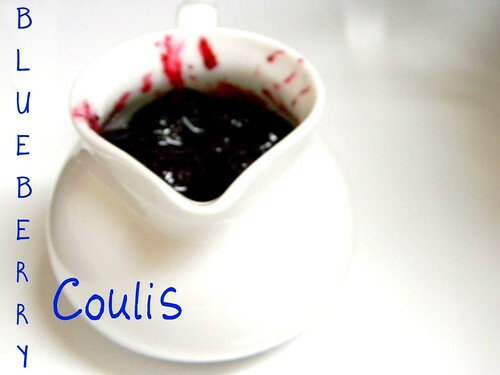 Serve slices with blueberry coulis (see below) and a dollop of lemon yogurt, if you so desire. Enjoy! 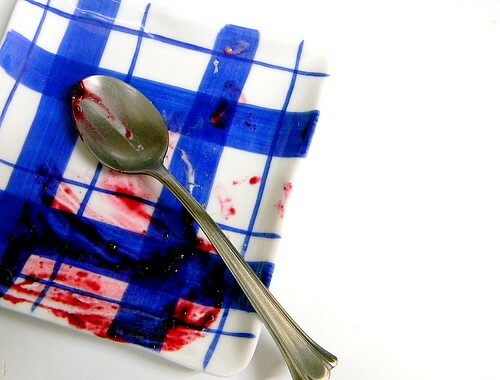 Cook blueberries in a small pot over medium heat, with a small amount of water to prevent scorching. Cook until the juices are released and berries have softened. Add honey to taste, if necessary. Lovely post, and I bet this tastes delicious! Thanks, Iris! It is a lovely dessert. Hi Shirley, I did those overhead shots in the morning and once I was done, I ate that slice for breakfast! 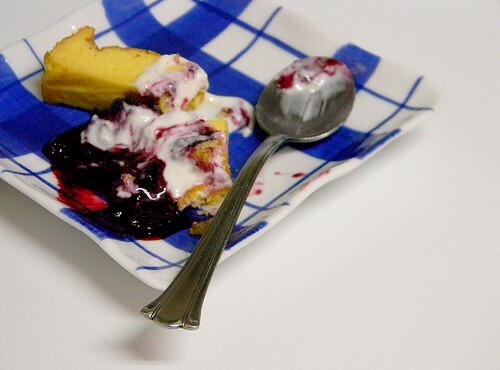 😉 I was originally thinking of putting the blueberries in the cake but thought the berries might sink to the bottom…as it is, the coulis gives people the option of if they want the cake with or without blueberries. A win-win! Hi Ariana, I would add the lemon juice or extract to taste, suited to your own personal preference, although keeping in mind that the lemon yogurt is what mostly gives this cake its lemon flavour. A tablespoon or two of juice would be good for starters; for extract, flavouring the amount required in the recipe, I’d start with a teaspoon and up it until lemony enough for myself (same for the juice). I’m glad your brother is able to tolerate more dairy now! That’s great! This cake looks so lovely. I love it when baking inspiration strikes like that! Hi Kaitlin, everyone is glad – including him, naturally! Thanks about the cake. 🙂 It seems fancy but really it’s a cinch to whip up. For those who are okay with cow dairy yogurt and aren’t 100% refined sugar-free, I first used Liberte’s Mediterranean lemon yogurt for this recipe. My brother eats Liberte’s goat yogurt. 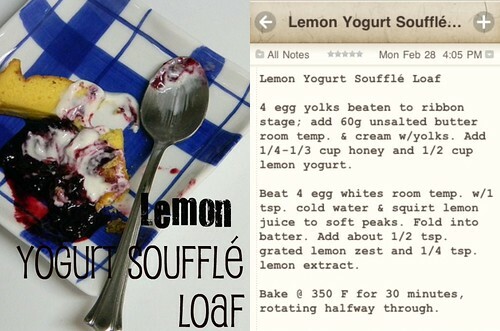 The recipe did not say when to add the lemon yogurt. I see now that it is in the photos, but not in the written version. We had some issues getting the egg whites to whip, which I have not encountered before, but maybe we added the lemon juice too soon. As a result, our loaf was more of a dense pudding. It also need about 20 more minutes to bake. It was tasty, though! Thanks for your interesting recipes…. Hi Laura, thank you for the feedback. I’ve fixed the written recipe instructions to include when to add the yogurt. Have you seen my tutorial on how to make meringue? The lemon juice is added at the beginning, before beating the egg whites; it acts as a stabilizer like cream of tartar or a pinch of salt would work. Also, I’ve only ever used freshly squeezed lemon juice. Bottled lemon juice may act differently, if that’s what you used. Other pointers could be that perhaps the bowl or beaters you used was not completely dry before using? (I don’t know, I’m just thinking up possible scenarios.) Anyhow, I’m glad that it still worked out for you! Zoe, this cake looks AMAZING!! I cannot wait to try this! What a perfect spring-time cake! And I, too, have lemons and blueberries on my mind. I have my spring time lemon blueberry muffins set to post soon!! What a beautiful treat this cake is!! Thanks, Kim! Those springtime lemon blueberry muffins sound great, looking forward to seeing your post. Hi Maggie, I’m so glad now I took pictures of my dirty plate after eating breakfast for dessert! 😉 Thank you, we are all so glad that he’s getting better and better everyday and that’s he able to participate more in eating different foods, especially those previously off-limits. Pretty soon I can do pizza with cheese, either Daiya (spotted it at my local Whole Foods) or goat cheese, and he can eat it. This looks so good. Gooey, messy desserts are the best!